Chinese New Year is coming and it is a time where all family members near and far get together for the reunion dinner which is on Chinese New Year eve which is on 27 January 2017. It is a time for families to put aside all differences and reunite. More important than the dishes on the table are the people sitting at the table. 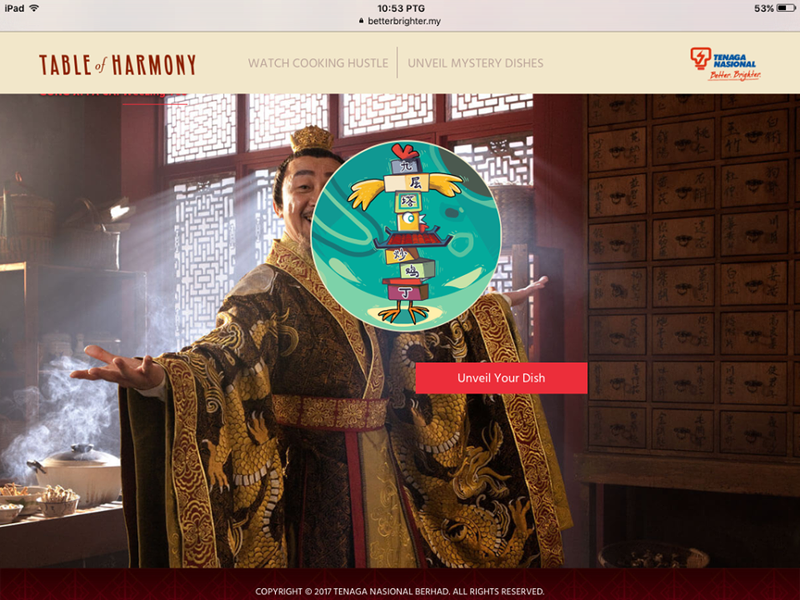 Have you seen the Cooking Hustle - TNB Chinese New Year 2017 webfilm by Tenaga Nasional Berhad (TNB)? If you haven't, let's watch it now. I like it very much as it is very meaningful. 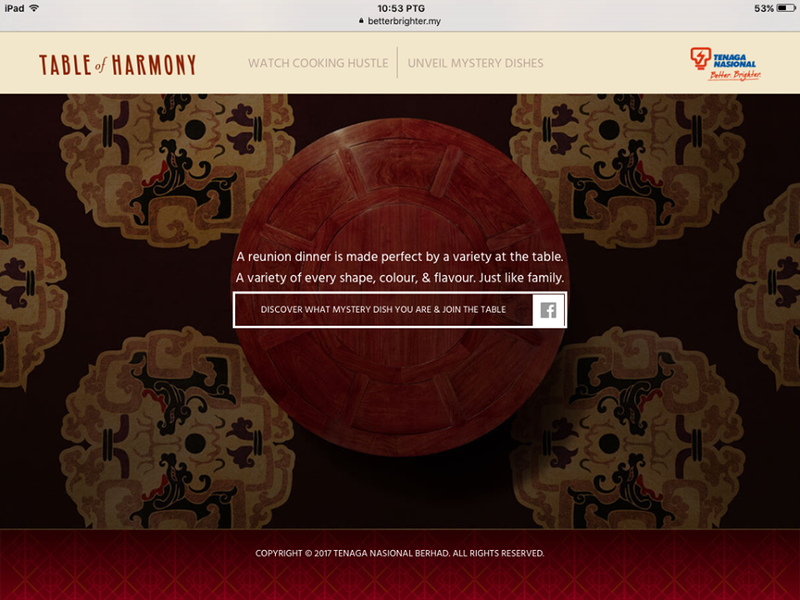 The Table of Harmony shows that all family members are of different personalities and sometimes there are clashes during reunion especially in big families. But it is our differences that give the occasion its unique flavor. Just like the Chinese New Year dishes on the table, our loved ones come in all shapes, sizes, colors and flavors. When we work together as family, there is no challenges that cannot be overcome. When we come together, everything is a little brighter and happy moments are made better. Let's discover what mystery dish you are and join the table. Step 2. Click on "Watch Cooking Hustle"
Step 4. 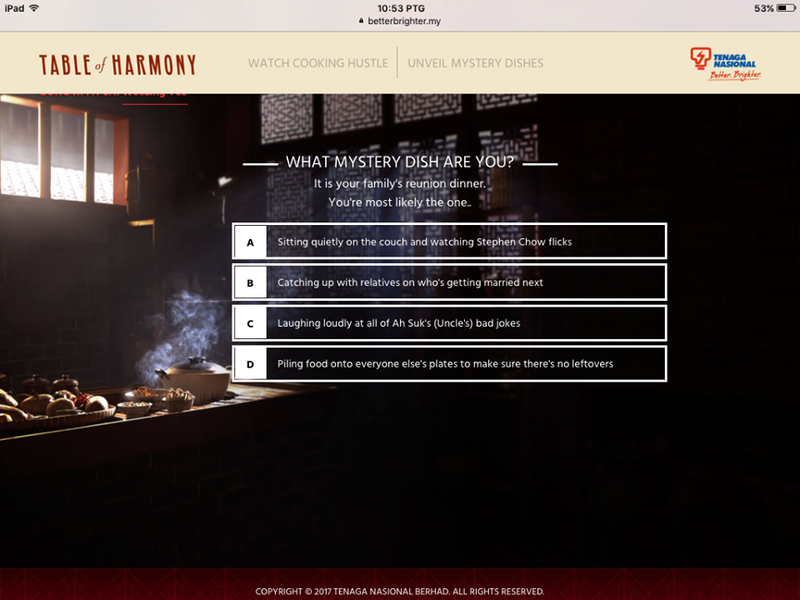 Click on "Unveil Mystery Dishes", then "Discover What Mystery You Are and Join The Table"
Excited to know what Mystery Dish you are? Come and join now. Remember to share your result with your friends and family on Facebook. 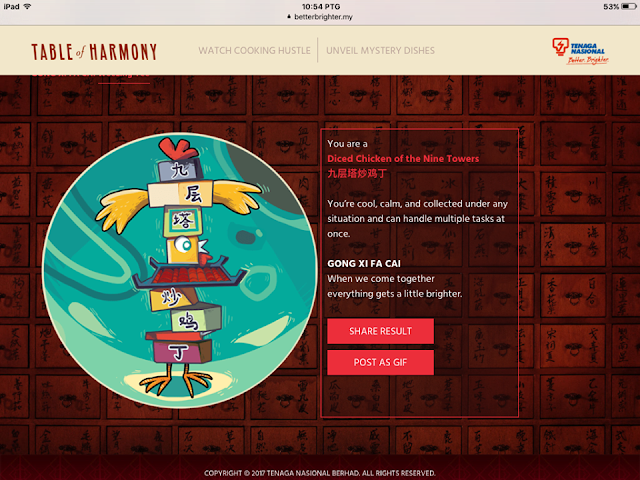 Happy Chinese New Year and enjoy your time together as family! Churros is a kind of fried dough pastry usually dipped in chocolate sauce and it is originated from Spain. 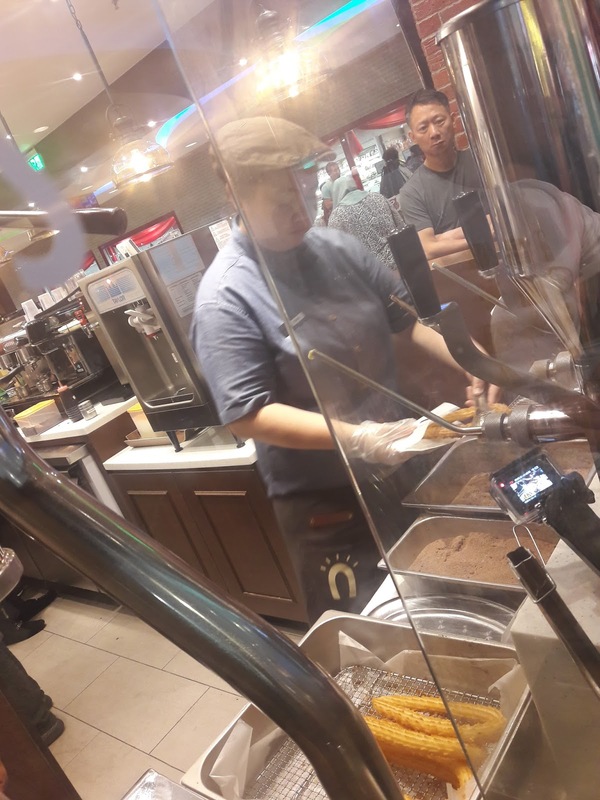 Street Churros started in Korea where they were crazy about street food. 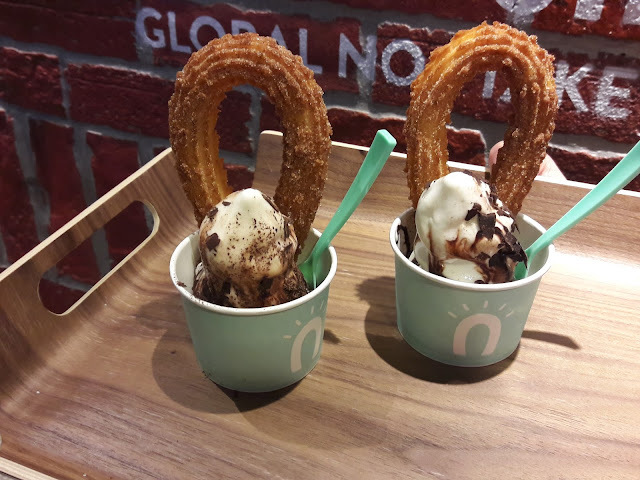 Street Churros wants to elevate street food with premium, fresh ingredients and be the Global No. 1 take-out cafe. If you ever have the cravings for Churros or for those who have not tried them before, you do not need to travel far because Street Churros Malaysia has 4 branches in Malaysia - IOI City Mall, 1 Utama, Berjaya Times Square and Sky Avenue Mall, Genting Highlands. Street Churros plan to open more branches very soon. 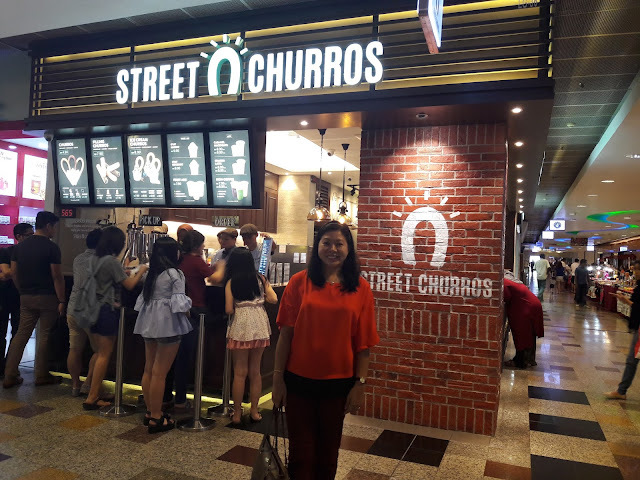 Thanks to Street Churros for the food review invitation at Berjaya Times Square last Saturday. 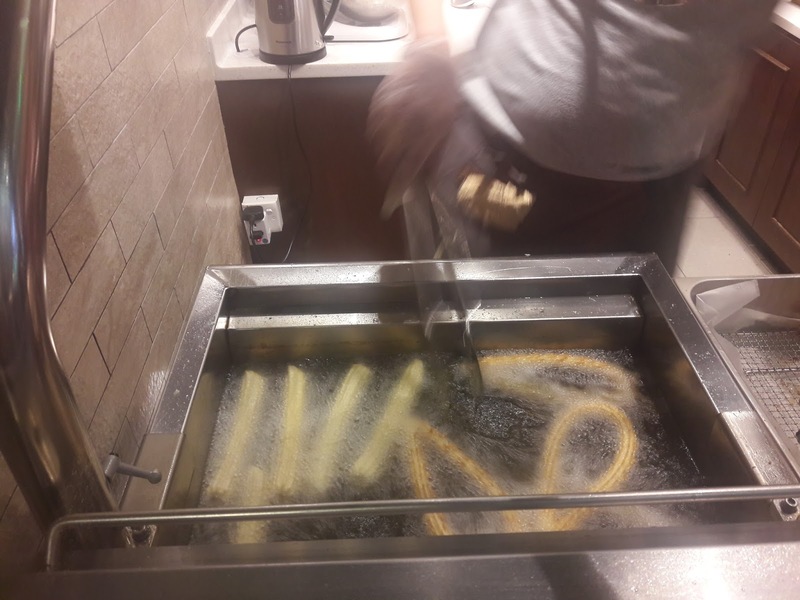 My kids and I really enjoyed our Churros very much. It is very crunchy on the outside and soft on the inside and there were many dipping sauce and flavors to choose from. My children love the Cheese Churros the most and I like the Cinnamon Churros which is also their best seller. 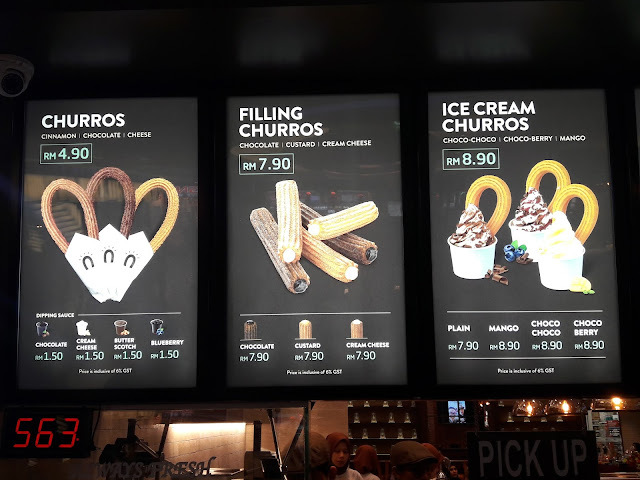 The different types of Churros. 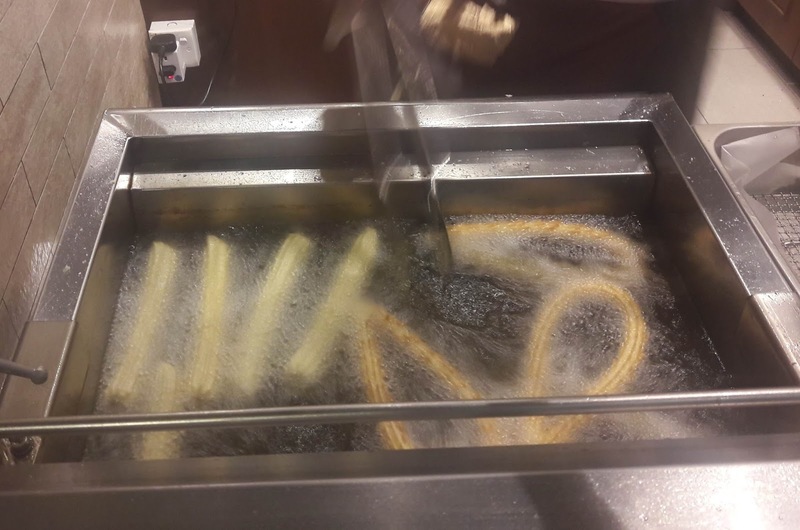 Street Churros is made using the machine for accurate length. Coated with either cinnamon, chocolate or cheese powder. 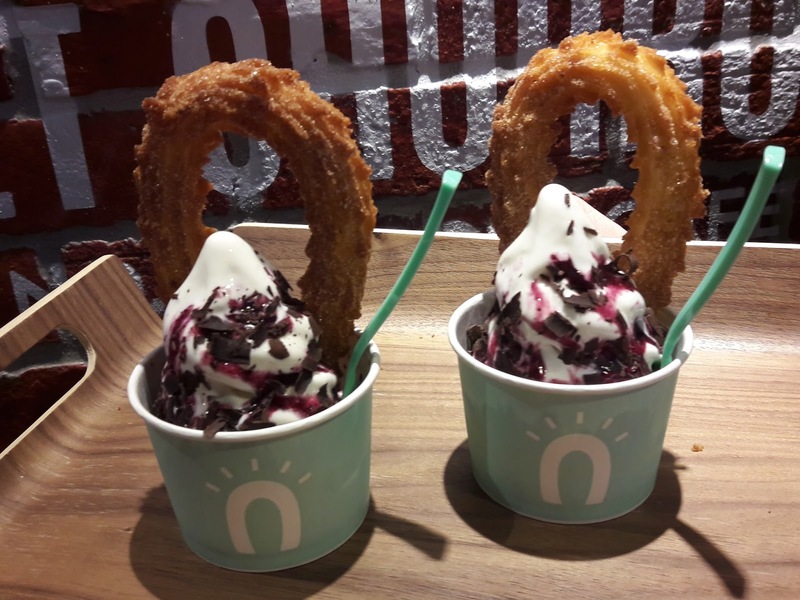 Cinnamon, Chocolate and Cheese Churros with these dipping sauce - Chocolate, Cream Cheese, Blueberry and Butterscotch. 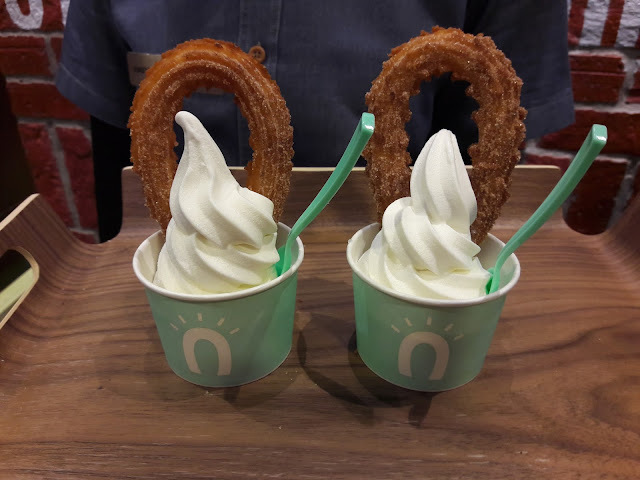 I really liked the Cinnamon Churros with the Cream Cheese dipping sauce because the Cinnamon Churros is sweet and goes well with the Cream Cheese which is slightly saltier. The Blueberry and Butterscotch are both very sweet. 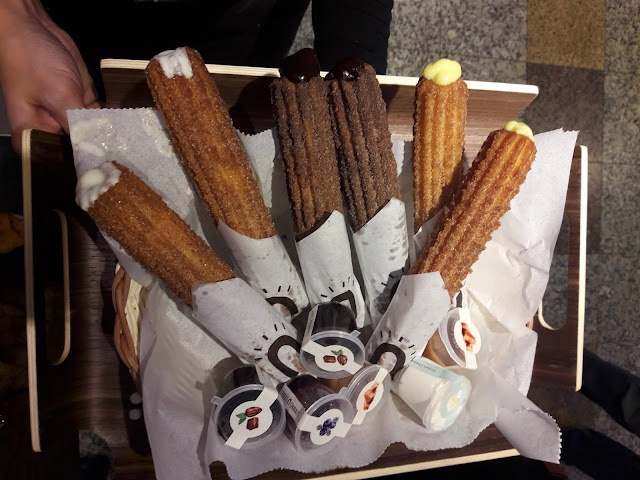 This is the Filling Churros. From left to right, the fillings are Cream Cheese, Chocolate and Custard. This type is bigger and the fillings just ooze out into your mouth when you bite it. 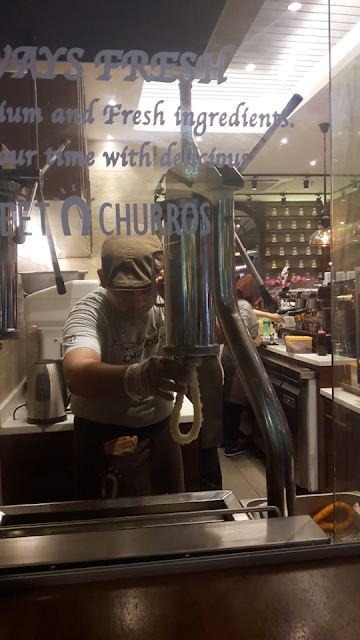 I personally like this Filling Churros the most. I tried the Chocolate fillings and really loved the strong chocolate taste. I want to try the Custard fillings the next time I have my Churros. 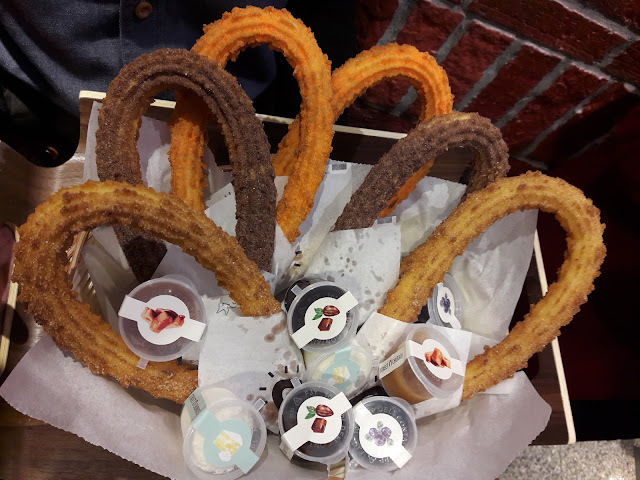 Ice Cream Churros also known as Ah-Chu are my children's favorite. You can have yours plain or with any of the 3 flavors, Choco-Choco, Choco Berry or Mango. For me, I liked the mango flavor the most. 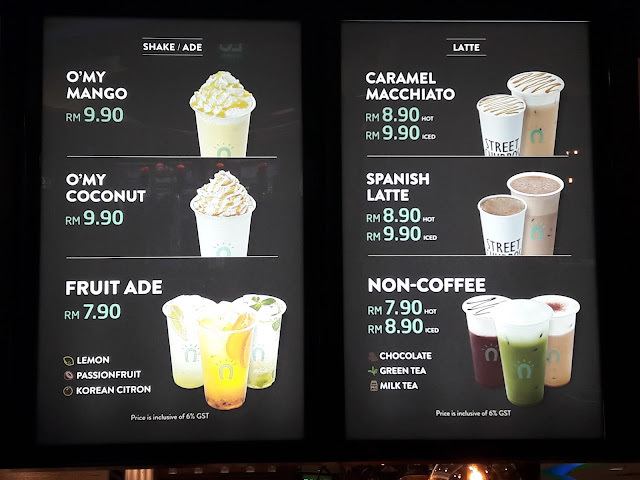 Besides Churros, there are many types of drinks you can enjoy. I loved the O' My Coconut shake as it tasted sweet and unique with the coconut flavor. I would recommend this because I really fell in love with it just after one sip. These are the Fruit Ade. From left to right, Lemon, Passionfruit and Korean Citron. 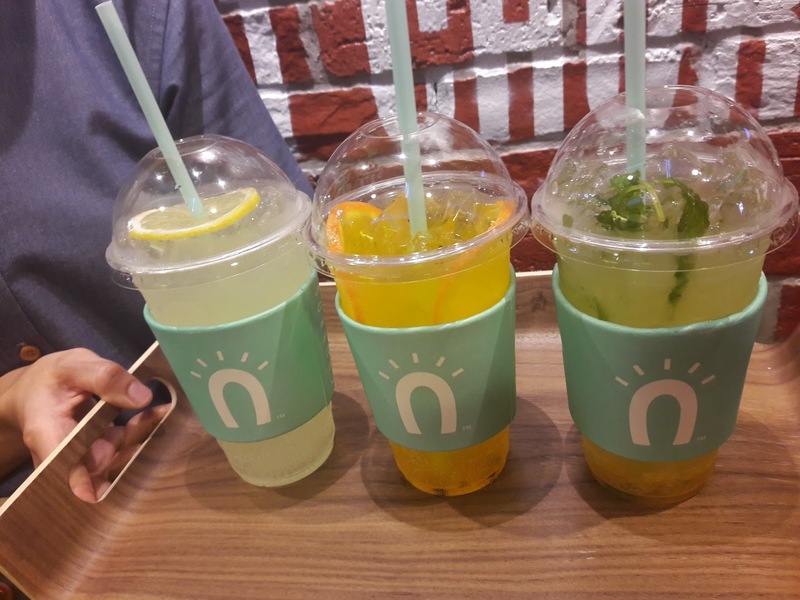 If you like passion fruit, don't miss trying out the Passionfruit Ade because it was really refreshing and cool. My son loves the Lemon Ade because it was sweet and not too sour. 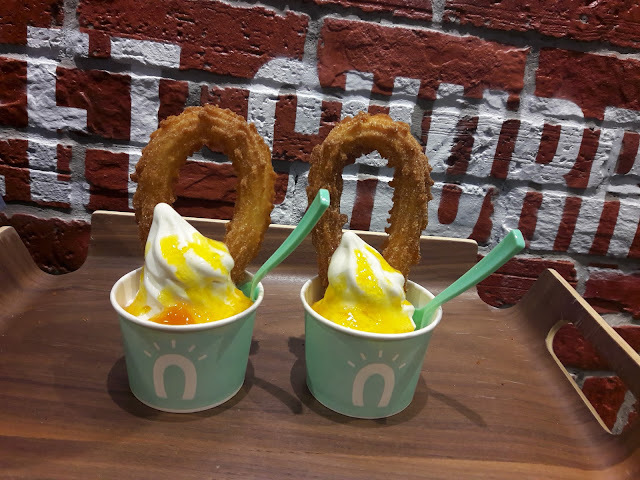 I have yet to try the Korean Citron and would love to try it when I visit Street Churros again. 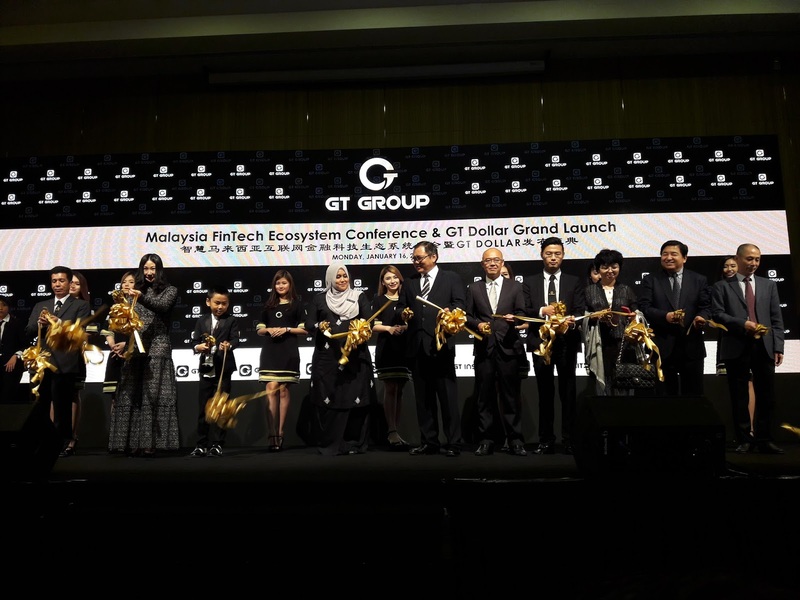 I was at the Malaysia Fintech Ecosystem Conference and GT Dollar Grand Launch on 16th January 2017 at Sime Darby Convention Centre, Kuala Lumpur. Y.B. 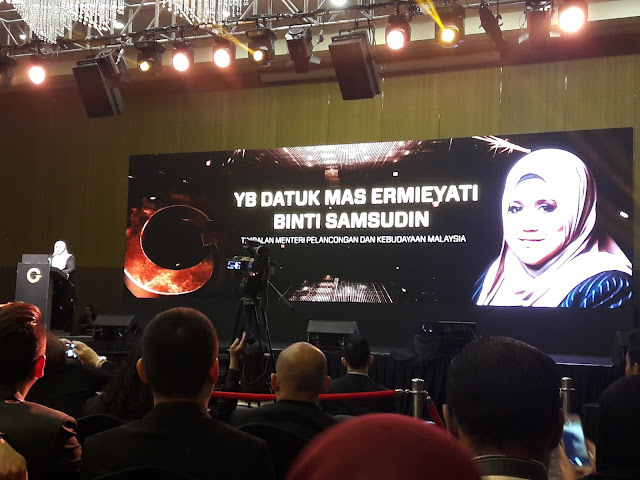 Datuk Mas Ermieyati Binti Samsudin, Deputy Minister of Tourism and Culture debuted the launch of e-commerce giant, GT Dollar Malaysia at Sime Darby Convention Centre, Bukit Kiara, Kuala Lumpur today at the Malaysia FinTech Ecosystem Conference and GT Dollar Grand Launch. 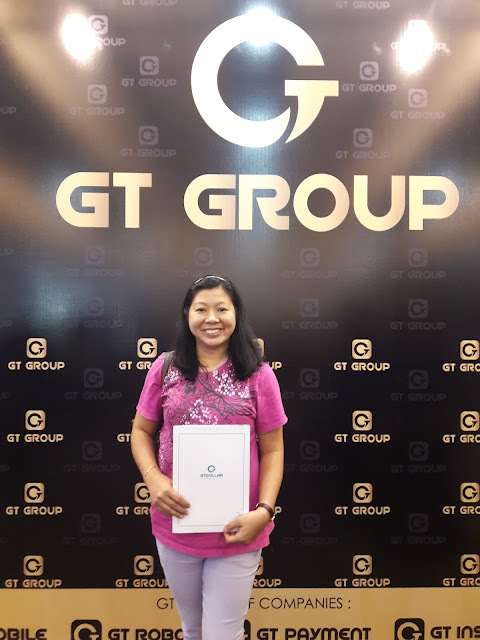 To complement this collaborative effort, GT Robot an innovative high-technological firm under the GT Group, specializes its advancement in humanoid robotic solutions. 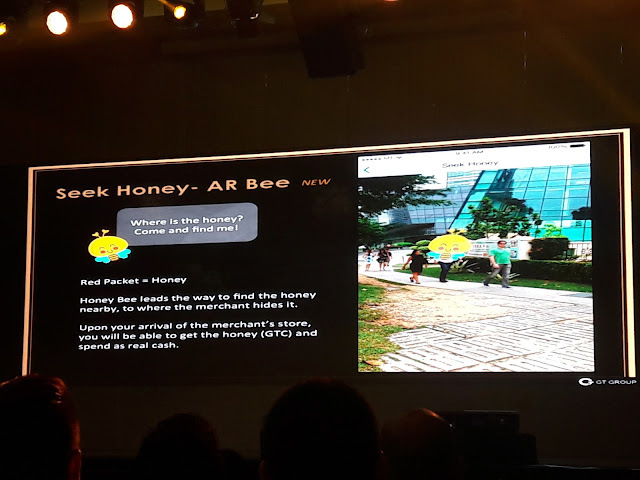 In recognition of it’s advancement, the Malaysian government is planning to allocate a zone located along the Malacca-Negeri Sembilan border for GT Robot’s own manufacturing and assembly plant, which is worth approximate to RM 300 million in investment. This plant estimated to generate income for the company of approximate USD 20 Billlon (which is equal to 10 Million pieces of Mobile Robot) and create more than 10,000 working opportunities for locals in the next 5 years. The GT Robot plant will be the first in Asia with eco-friendly manufacturing with the high technology equipment after China. Today, marks the launch of a groundbreaking event that will go down in history. Unveiling an all new improvised major update of GT Dollar application, the world’s first social mobile e-commerce software. 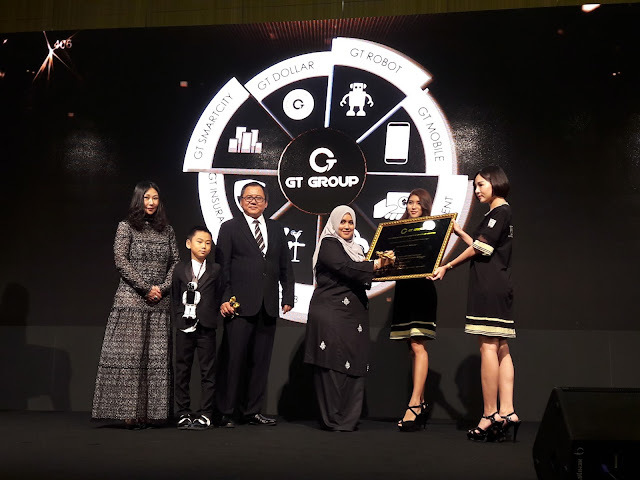 This new concept was first found in year 2014 by the GT Group President and CEO Dr. Paul Zhang Baolu, who is equipped with over 30 years of industry experience in high-technology management, economic and tourism development worldwide. The company is valued at more than $4.7 billion. 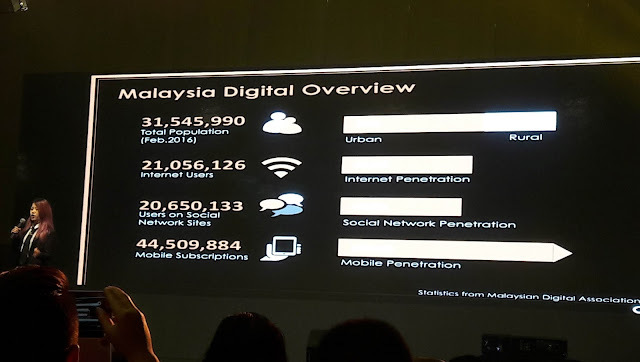 The conference is aimed to drive development of regional internet use, where users and businesses connect seamlessly without barriers. 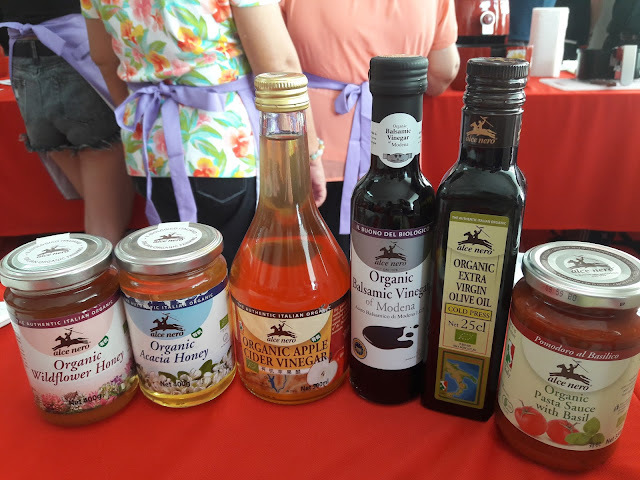 This benefits the consumers greatly as businesses become more affordable thus stimulating economic growth, national tax revenue and employment growth. As a major update, there will be new enhanced key features to help alleviate the overall user experience. Through the adoption of SMART technologies which comprises of AR technology to implement “the seek honey feature”, “catch a bee to earn GT Cash feature” which can be used for purchases within the interactive marketplace as well as being an effective Bee Commerce tool to help users manage their finances effectively by enjoying exclusive long term savings, emerging as Malaysia’s trendsetter in the world of e-commerce. This application aims to embrace technology, thus contributing towards the economic growth of the country. A comprehensive platform for both consumers and merchants, encouraging cash free transactions around the world. With zero registration, subscription and advertising fees, merchants need to purchase GT Dollar (Virtual Currency) and distribute it to their users anytime, anywhere. This will in turn form into e-promotion or e-advertising with minimal charges. The Online Payment Gateway will be used to accept payment online – E-wallet / Visa (Credit, Debit, Prepaid) / MasterCard (Credit. Debit, Prepaid) / CUP Card (Credit, Debit, Prepaid) / Direct Debit Account to perform transaction charges. 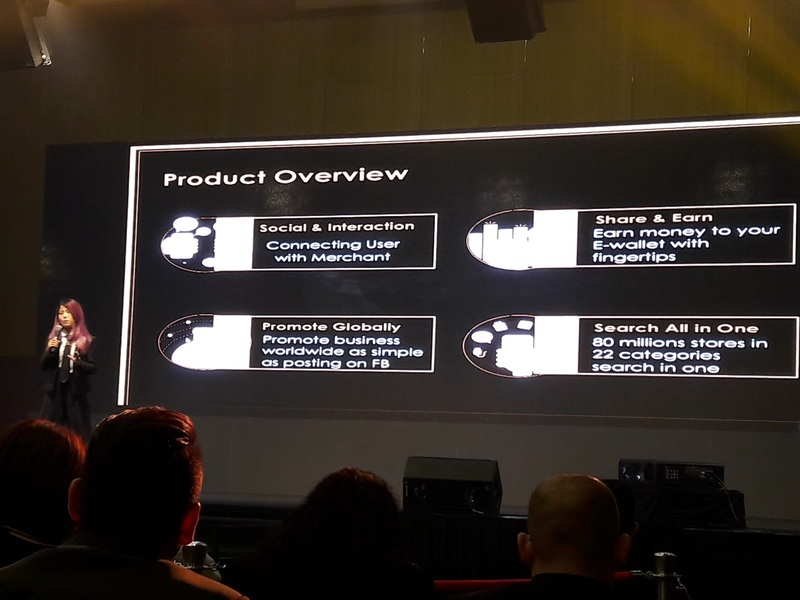 GT Dollar primary focus is about creating a world of convenience centered around virtual credits account to allow users to make payment via an e-wallet system which enables extensive search for products or services via a marketplace. The application serves as a composite of one’s daily lifestyle and a city guide to complement and simplify the increasingly hectic lifestyle by providing users with an unprecedented access to a large database of over 80,000 merchants worldwide hitherto not on Internet or mobile, but who offer a great range of products. Merchants and users can enjoy other services beside online shopping such as fund transfer, utilities bills payment, prepaid air time top-up, Social Network Chat (for up to 20 people in each group) and etc. As per statistic, there are more than 18 million active digital users in Malaysia and up to 2015, a total 77.3% of Malaysian households have access to broadband services. The application is active all through the day, allowing users to shop at their own convenience at the ease of their Smartphone. "We saw the opportunity to take advantage of the digital boom and developed an innovative solution that benefits both businesses and consumers." said Mr. Patrick Chew, Country CEO of GT Dollar Malaysia. 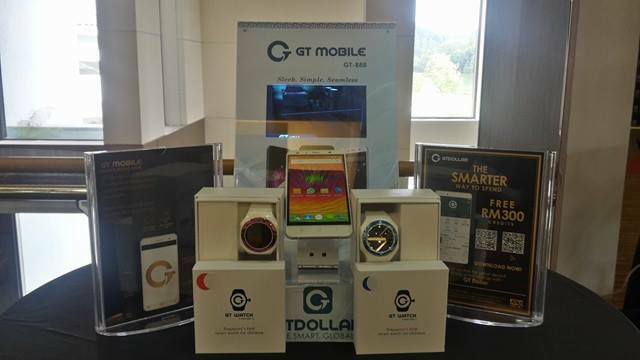 GT Dollar Malaysia hopes to expand its e-commerce business globally and be the gateway for Asia. 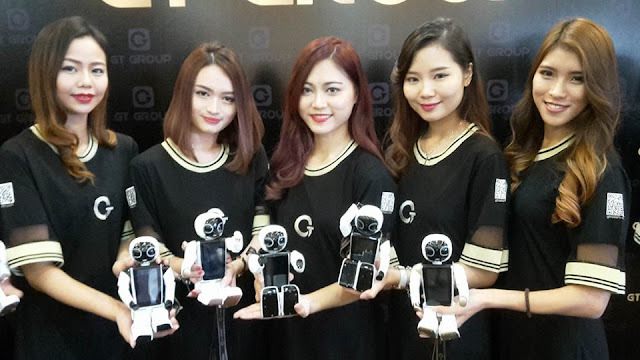 At this launch, GT Robot, the innovative high-technological wing of GT Group that specializes its advancement in humanoid robotic solutions will be unveiling two of its robots called the GT Wonder Boy, a SMART social bot companion and GT Robot, a multifunctional service bot that is targeted to improve the overall quality of people’s life, transcending into a new era of intelligence. Bandar Sunway, 18 January 2017 – The Chinese Lunar calendar will soon usher in the year of the fire rooster. Well known to be a symbol of flamboyance and colourful personality, the fire rooster is characterised by its strong will and enthusiasm. Likewise, Sunway Lagoon is leaving no stone unturned in welcoming in this auspicious year to ensure a celebration like never seen before with extraordinary sights and sounds in Malaysia’s premier theme park. Visitors can expect a myriad of initiatives and festivities as the New Year approaches, with offerings for the whole family, promising a joyous celebration unlike any other. 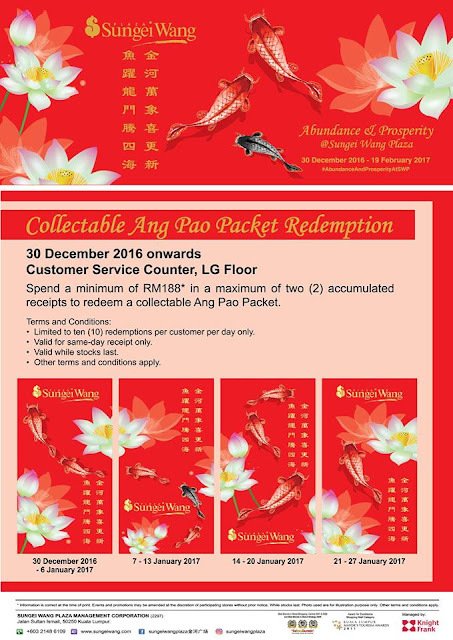 For starters, the first 1000 guests who enter the park on the first five days of Chinese New Year (28 January to 1 February) will be rewarded with traditional Chinese Ang Pows or “Red Packets” which will consist of attractive goodies worth RM100 each! These include vouchers offering discounts on entrance for as much as 32%, retail vouchers worth RM10 and a photobook voucher worth RM79. 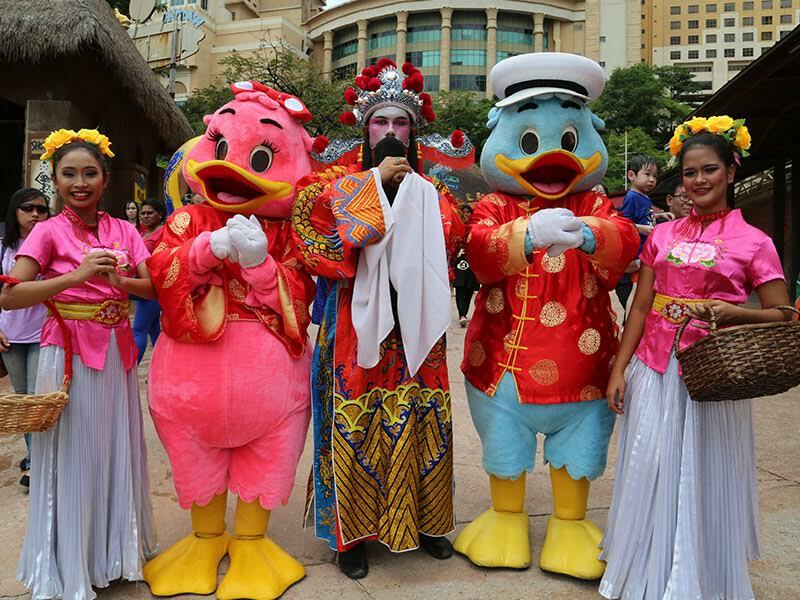 The Red Packets will be given out at both the main entrance and Surf Beach entrances of Sunway Lagoon by the park’s very own celebrity couple – Captain Quack and Lady Quack, together with the God of Prosperity. 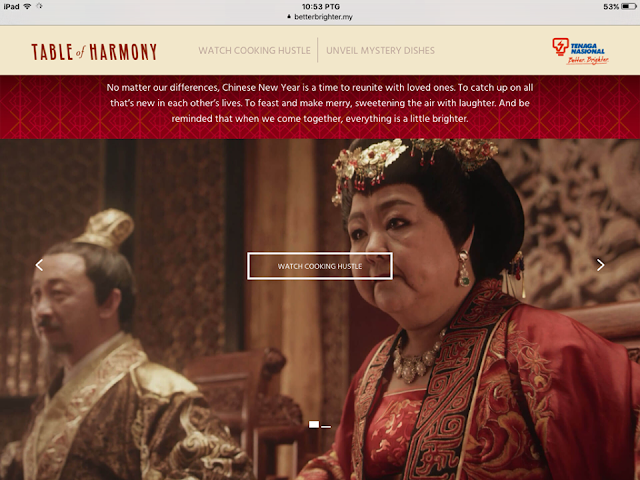 This will also be a rare occasion where guests will get to witness the couple to be all decked out in traditional Chinese costume. Once inside the park, guests will be mesmerised by an array of performances every day from 29 January till 1 February. 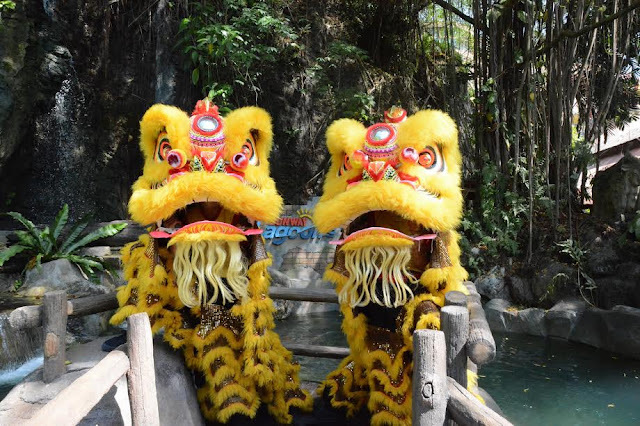 Every morning on all four days, early birds to the park will be welcomed by a Characters Meet & Greet at the Carousel at 9.40am, followed by a dazzling lion dance performance by Shaolin GC. The fanfare continues in the afternoon at 2.15pm featuring an energetic Kung Fu performance and followed by the thunderous 8 Prosperity Drum performance – truly an event not to be missed. Meanwhile, Nickelodeon’s most beloved icon, SpongeBob SquarePants will make a special appearance at the recently opened Nickelodeon Lost Lagoon – a photo opportunity not to be missed by SpongeBob fans both young and old. To sweeten the occasion, Sunway Lagoon staff will also be on hand to give out Mandarin oranges and fortune cookies to leave a truly lasting impression of the festivities. “While every day is a celebration here at Sunway Lagoon, we’re pulling out all stops this Chinese New Year to ensure a truly memorable celebration for the whole family to usher in the year of the fire rooster,” said Sean Choo, General Manager of Sunway Lagoon. “For four days, the entire park will be transformed into a carnival unlike any other, truly befitting the occasion. It’s our way of showing our appreciation to our guests over all these years and to cement our position as a premier theme park not only in the country, but internationally as well, as reflected by the large number of international tourists we welcome through our doors every year. This celebration will be truly a spectacle to behold not only for our international guests, but even those from within Malaysia,” he added. Leading up to the festivities, guests visiting the park from now to 20 January will stand a chance to win an afternoon tea for 10 at Sunway Hotel Resorts & Spa worth RM 1,250 and free admission tickets to Sunway Lagoon. All guests have to do to participate in the contest is to submit a memorable photo with their friends and family taken at Sunway Lagoon and describe the best day ever at Sunway Lagoon in not more than 150 words. More information about the contest and other Chinese New Year Festivities can be found at www.facebook.com/SunwayLagoonMalaysia or by calling Sunway Lagoon at +603-5639 0000. 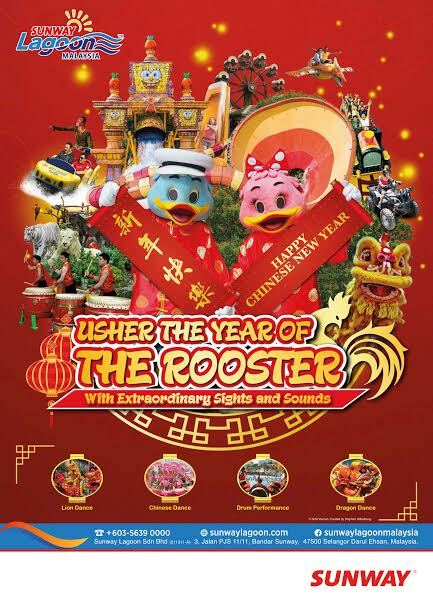 So be sure to visit Sunway Lagoon this Chinese New Year for a celebration befitting the year of the fire rooster, which is sure to create wonderful memories for the whole family for many more years to come! Chinese New Year (CNY) will be coming soon and this is a good time to learn new recipes to cook for your family. 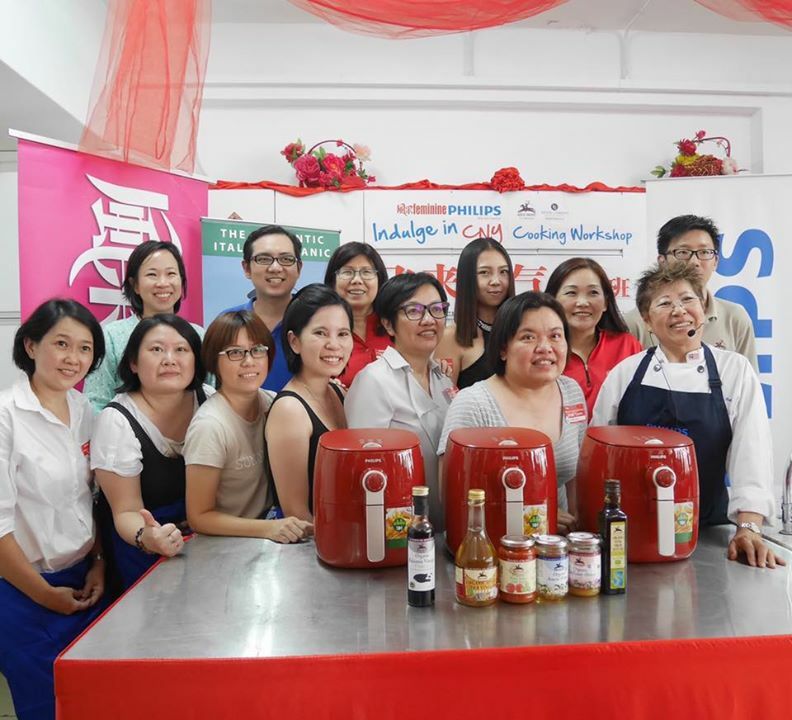 I went to the Philips Airfryer Cooking Workshop at Feves de Choco, Setapak last Saturday to learn to cook new CNY dishes with Chef Amy Beh. 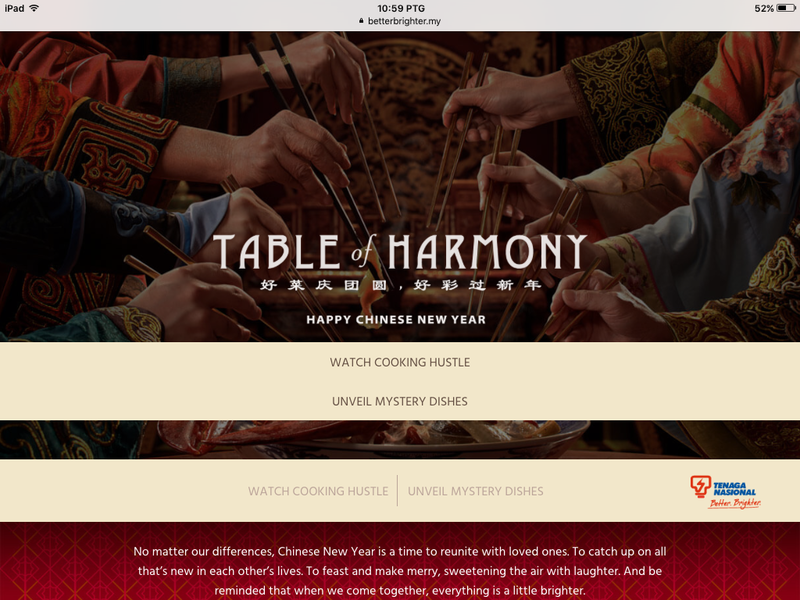 As many prepare to welcome the Year of the Rooster, it is time to fill the dining table with traditional Chinese New Year dishes to usher in more “fatt” with less fat with the help of Philips. Among the must-have dishes at the table are fish to signify abundance, spring rolls and dumplings to represent wealth, tang yuan also known as sweet rice balls for family togetherness, and oranges, tangerines and pomelos for fullness and wealth. As significant as each dish is, it is also important to remember that cooking methods have health consequences. For example, consuming too much oily fried food is bad for the heart. This Chinese New Year, Philips Malaysia is collaborating with celebrity Chef Amy Beh and Feminine magazine to introduce the healthier versions of several familiar traditional dishes made using the Philips Airfryer with new TurboStar technology. 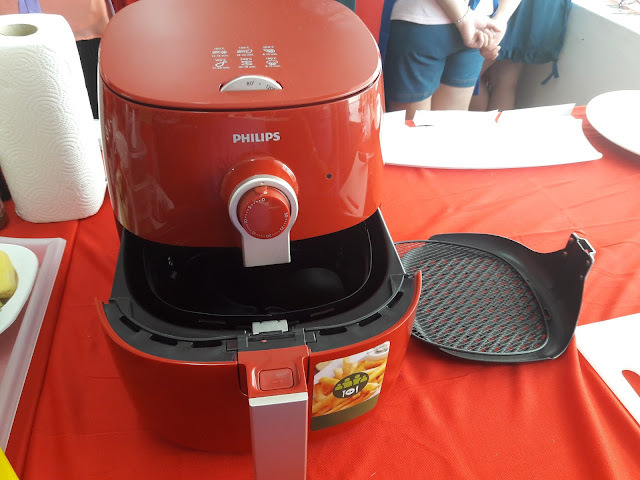 Now armed with TurboStar technology, the Philips Airfryer TurboStar is the latest in the Philips range of airfryers that helps consumers lose the oil but not the taste when cooking. From roasted pork to steamed chicken and spring rolls, the Philips Airfryer can help with the preparation of a complete Chinese New Year dinner for the coming Year of the Rooster. 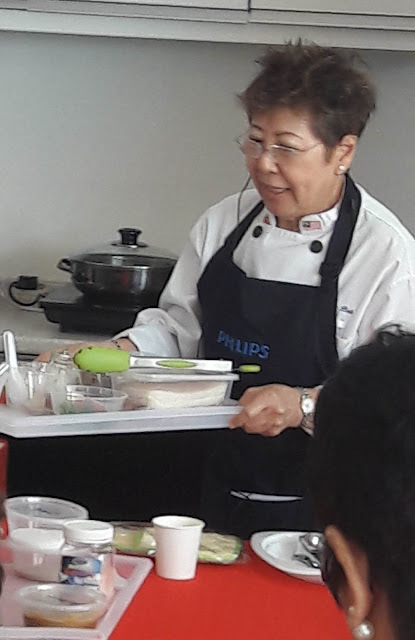 All the participants of the cooking workshop had their hands on experience using this new Philips Airfryer TurboStar range. This is better than the old range that I am using because the basket can be taken out from the handle making it much easier to wash.
Cheh Amy Beh taught us to cook 3 dishes - Tong Kwai Flavor Roasted Pork, Grilled Spicy Fish With Wonder Mushrooms and Tamarind Honey Prawns. 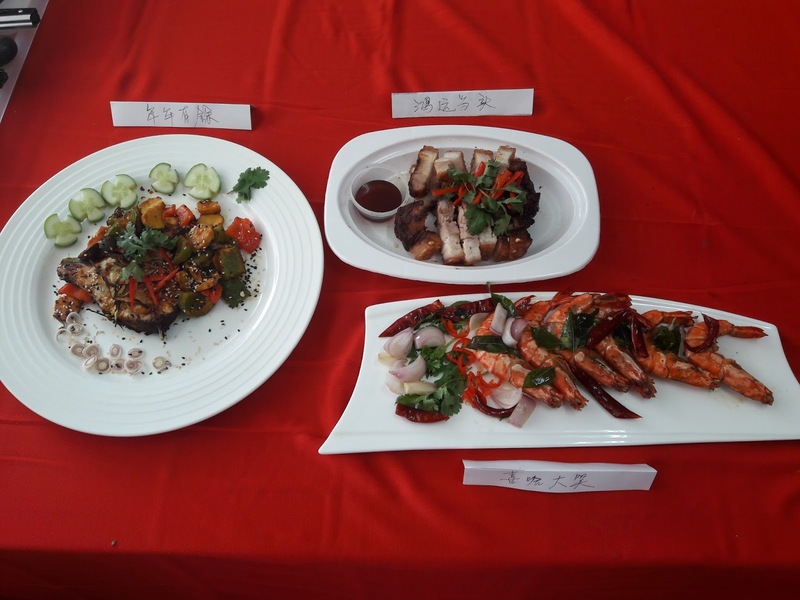 My team cooked these 3 dishes. I liked the roasted pork the most as the skin was crunchy and meat was delicious. It's crispy on the outside and tender in the inside. These 3 dishes were cooked with organic Alce Nero products. Team performance winner group photo with the judges. 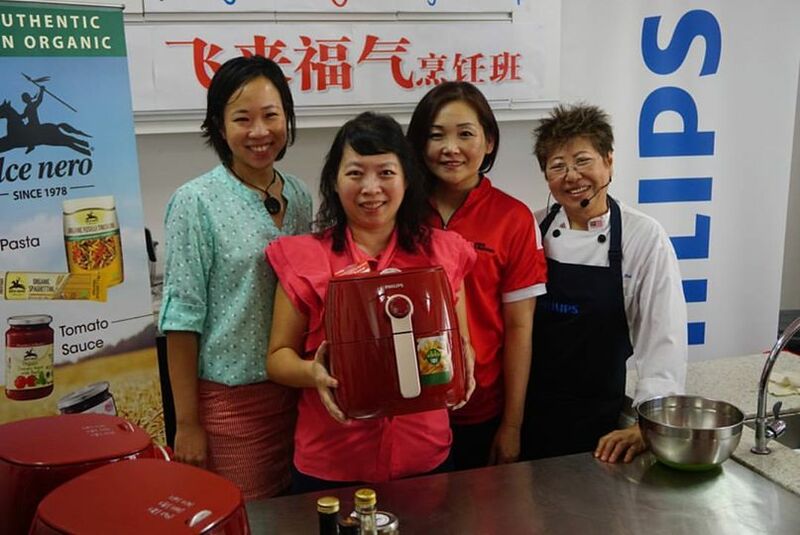 9 participants each won the Philip Airfryer. and faster with no turning needed. 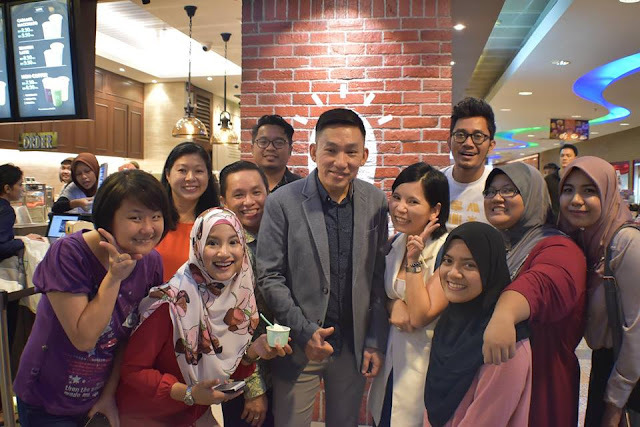 nationwide, at the Philips Brand Store in Publika Shopping Gallery Kuala Lumpur and Sutera Mall Johor Bahru and the Philips Experience Store in Bayan Lepas, Penang. It is also available online at the Philips Official store on www.blip.my or Lazada on http://www.lazada.com.my/philips-official-store/. Antabax, the no. 1 Halal antibacterial personal care range, Antabax organised a Doodle Competition for the second time, supported by the Ministry of Health & Ministry of Education and presented the prizes to the winners at Balai Seni Visual Negara on 7 January 2017. 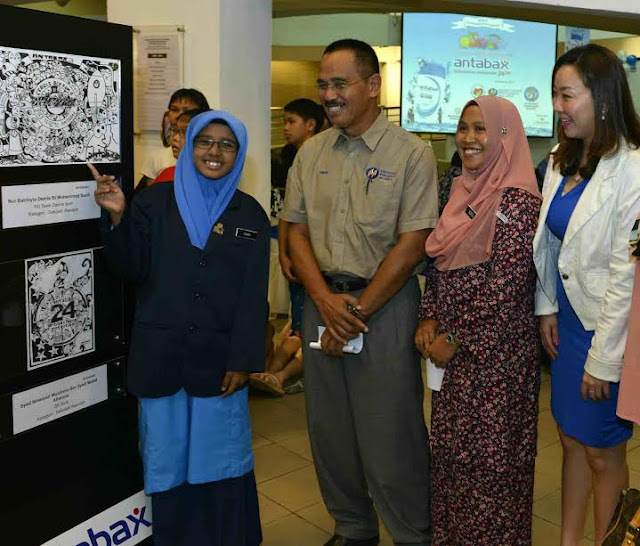 The ‘Cergas Bersama Antabax’ doodle competition ran from June 20 to September 30, 2016 on Antabax’s official Facebook page, and was proven a hit among Malaysians as it attracted over 1,200 nationwide entries from primary and secondary schools, higher learning institutions and a newly added open category. Doodles are spontaneous marks that can take many forms, from abstract patterns or designs to images of objects, landscapes, people or faces. Research in neuroscience, psychology and design showed that doodling can help people stay focused, grasp new concepts and retain information. Here are some of the doodles from participants. 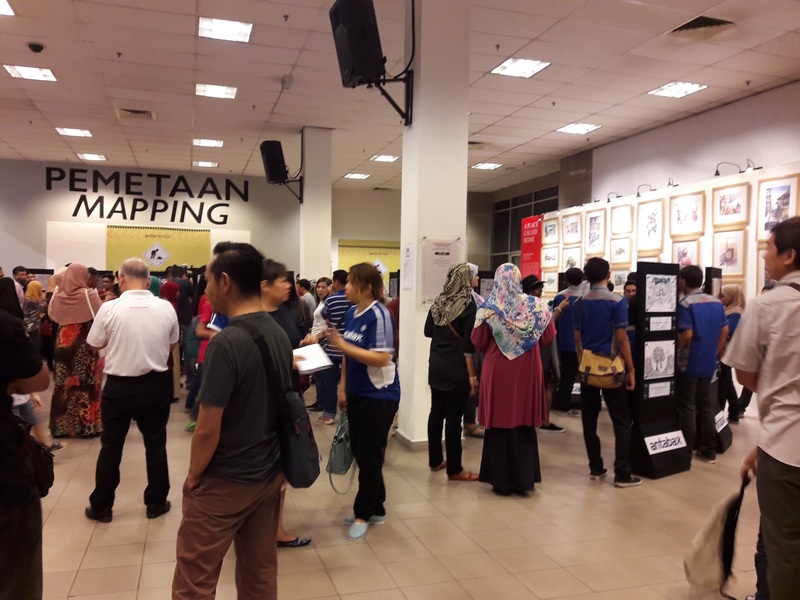 An exhibition of the 20 top doodle from each category, for a total of 80 exhibits was held at the National Visual Art Gallery, and was attended by the finalists, their families, friends and teachers who came from across the nation to show their support. First, second and third place winners from each category will be receiving RM3,000, RM1,500 and RM800 respectively, while 17 consolation prize winners from all categories will receive RM100 each for their efforts. 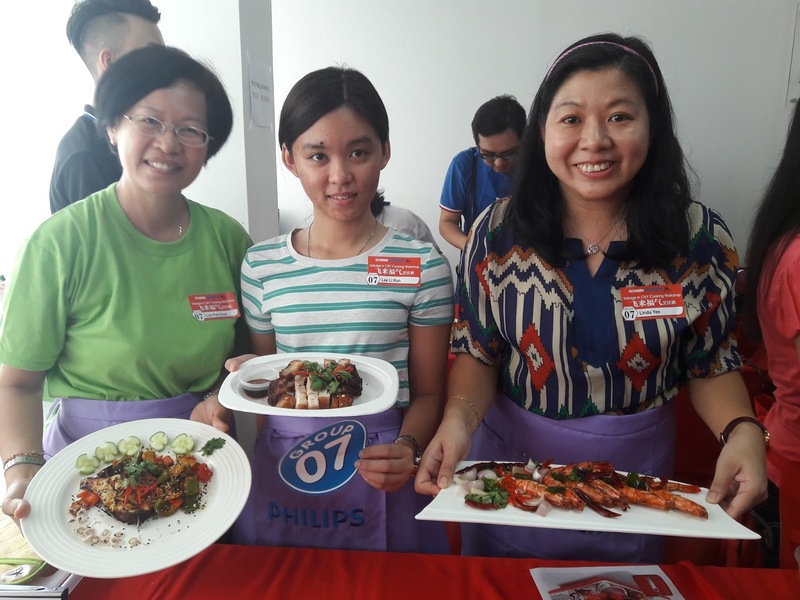 According to Ms Angeline Sim, the Group Product Manager, Household & Personal Care, Marketing Division at Lam Soon Edible Oils Sdn Bhd, the doodle competition was an effort to combine good hygiene practices along with cognitive and creative expression. (Second from left) Senior Principal Assistant Director, Co-Curricular and Arts Division, Ministry of Education, Mr Mahamad Amran Bin Kamsi, Senior Principal Assistant Director, Disease Control Division, Ministry of Health, Dr Norita Binti Shamsudin, led by Group Product Manager, Household and Personal Care Department, Marketing Division, Lam Soon Edible Oils Sdn Bhd, Ms Angeline Sim during the tour of the ‘Cergas Bersama Antabax’ Doodle Competition showcase. 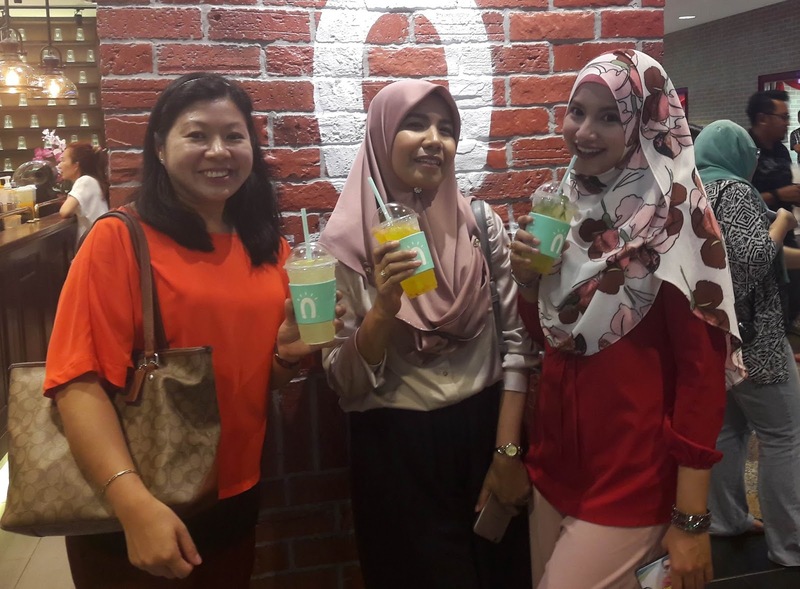 “This is a platform to create an in-depth engagement with consumers, and to encourage the younger generation to practice good hygiene habits through a platform they can enjoy while retaining information about health,” she explained. “Maintaining good personal hygiene is necessary for many reasons – health, social, psychological and simply as a way of life. It helps to prevent the spread contagious diseases that are spread via contact, and reduces bad odours. Since doodling is beneficial to memory and grasping new concepts as shown by research, it helps to reinforce the connection to keeping good hygiene for better health,” she added. A study in Applied Cognitive studies found that people who were asked to doodle while they were listening to list of people’s name being read to them were able to recall 29 percent more information when later they were surprised with a quiz. The top three winners from the primary, secondary, higher learning institution and open category of the ‘Cergas Bersama Antabax’ Doodle Compeition together with Antabax’s mascot, The Germ Buster. 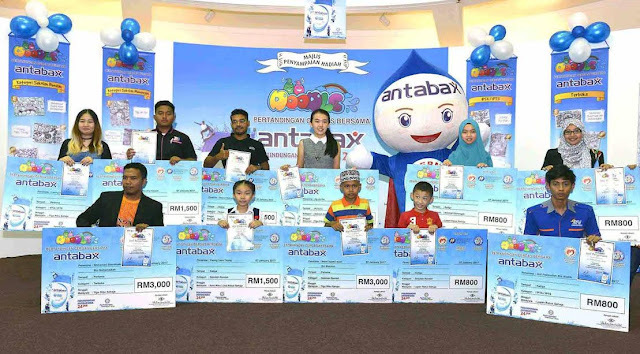 The top 20 winners from all categories of the ‘Cergas Bersama Antabax’ Doodle Competition and guests with Antabax mascot, the Germ Buster. First place winners in their respective categories were Mohd Syamil Aizat Bin Mesman, 12 years old from SK Limpoon 1 (Primary School Category), Ng Jie Xin, 17 years old from SMK Tun Saban (Secondary School Category), Leong Ka Mun, 18 years old from International Advertising, Communication and Technology College (Higher Learning Institution Category) and Mohamad Shariffudin Bin Mohamadiah, 35 years old from Negeri Sembilan (Open Category). All guests joined in for a live doodling session during the ‘Cergas Bersama Antabax’ doodle competition prize giving ceremony, showcasing the freedom of expression through art. According to Senior Assistant Director of the Co-Curricular and Arts Division, Ministry of Education, Encik Mahamad Amran Bin Kamsi, the art of doodling is a good platform to engage and educate the younger generation by allowing them to express themselves. 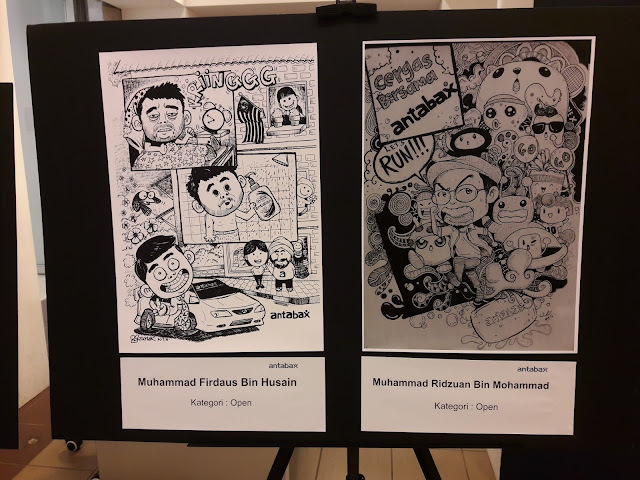 “Malaysians are very creative and many of the works exhibited good skills, technique and most importantly, imagination and creativity. The Ministry of Education is always on the lookout for new ways to create a positive engagement with students, parents and teachers, to encourage quality and creative learning,” he said. 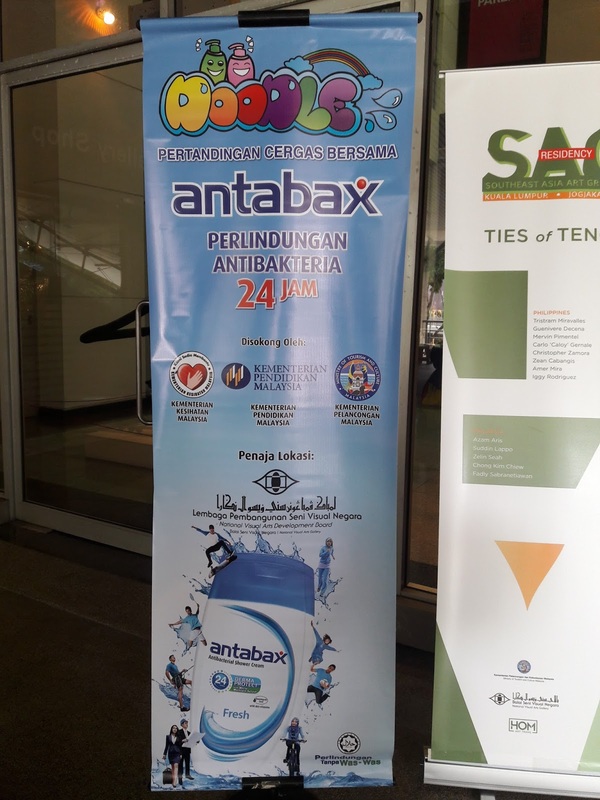 “The ‘Cergas Bersama Antabax’ Doodle Competition had the combination of creative learning and good hygiene values to impart, which is what we look for in a good program. This Doodle Competition is indeed an effective tool to educate regarding hygiene,” he elaborated. Senior Principal Assistant Director, Disease Control Division, Ministry of Health, Dr. Norita Shamsudin, also expressed that the ‘Cergas Bersama Antabax’ Doodle Competition was an innovative way to reinforce good hygiene practices among students and adults. “This is an activity anyone can do anytime and anywhere with a paper, pen or pencil. This is especially important in the younger generation as education regarding hygiene should start from an early age,” she explained. Meanwhile, Mohd Syamil Aizat Bin Mesman, winner of the Primary School Category expressed his joy after successfully winning the cash prize and Antabax products. “I love art and I doodle quite often in class as I find it a relaxing habit whenever I need to think. I am very happy that my artwork was chosen as the winner out so many entries, it makes me more confident with my drawing. I am thankful for this opportunity given by Antabax,” he said. The grand prize winner for the Secondary School Category, Ng Jie Xin from SMK Tun Saban said that she received strong support from her family to participate in the doodle competition. 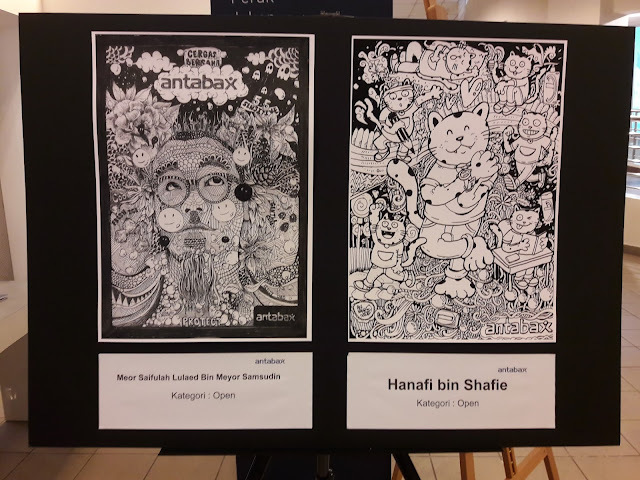 “My family members were very encouraging and supportive of me to enter the ‘Cergas Bersama Antabax’ Doodle Competition, especially my grandmother. Art has always been my passion and so I doodled ten different artworks for my grandmother to choose from and to our surprise, the one she chose won the competition! Thank you, Antabax for this platform and for giving all of us the opportunity to express our creativity,” she concluded. Top 20 winners from the primary and secondary category and their respective schools will also be receiving Antabax Care Kits, as a reward for their support and to further encourage good hygiene practices among schools. For more information about Antabax, or to be part of the Antabax community and to follow the best hygiene tips for a healthier and confident lifestyle, kindly “Like” Antabax at www.facebook.com/NewAntabax. 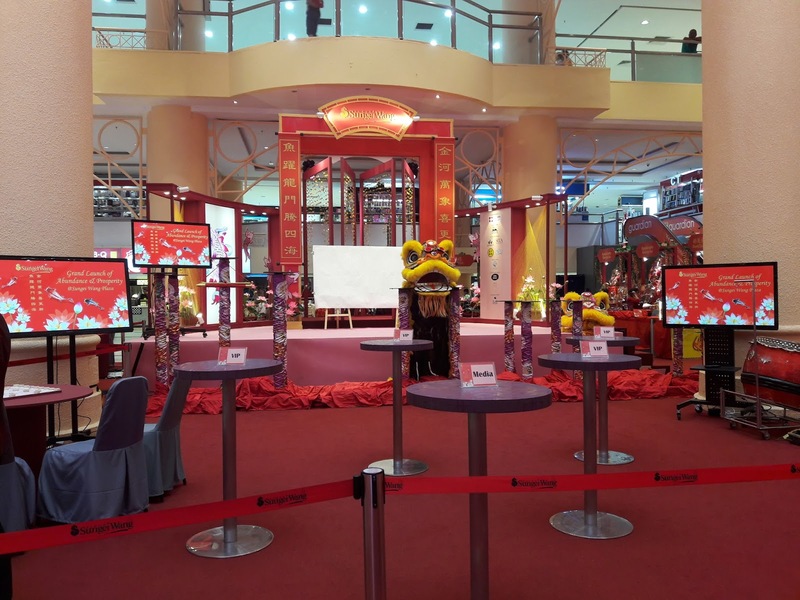 Sungei Wang Plaza is ushering in the Year of Fiery Fire Rooster with Abundance and Prosperity at Sungei Wang Plaza from 7 January to 19 February 2017. My children and I were there at the Grand Launch and we enjoyed every moment there. Step into the Atrium, a lotus flower pond with nine koi fishes jumping out. 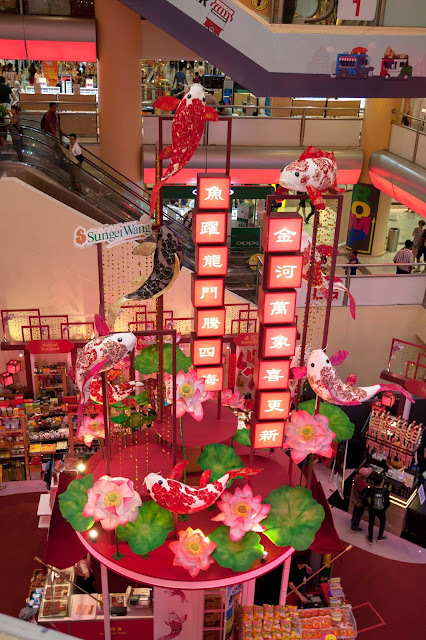 The nine koi fishes ascending upwards to the top of the dragon gate symbolizes leading shoppers and tenants to the triumphant new year. The number of nine and lotus symbolizes longevity and koi fish believes to bring prosperity and abundance for all. Not only that, a majestic stage with beautiful arches are set at Side Court to host entertaining and exciting Chinese New Year shows as we usher in the lunar new year. “It has been a challenging year in 2016, the fiery fire rooster year together with our Abundance and Prosperity decorations signifies our wishes to all our shoppers and tenants to have a smooth and prosperous year in 2017. Come and join us this Chinese New Year for all the exciting shows, activities, redemption, free gifts and market hall set up just for you.” says Yuen May Chee, Complex Manager of Sungei Wang Plaza. 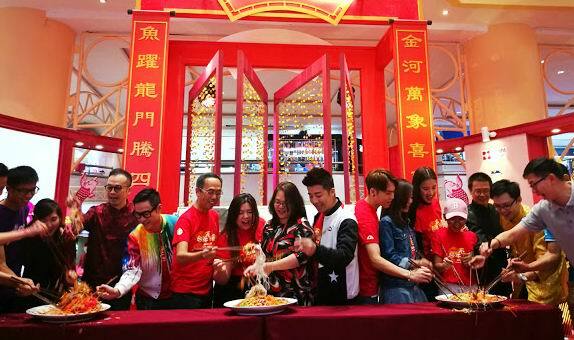 A star-studded media launch for Abundance and Prosperity at Sungei Wang Plaza was held on 7 January 2017. The launch was kicked off with an eight feet long Koi Fish FengShui Live Painting by Master Pang Heng Khan together with an acrobatic lion dance performance by the Malaysia Lion Dance Champion, Kwong Ngai Lion Dance. 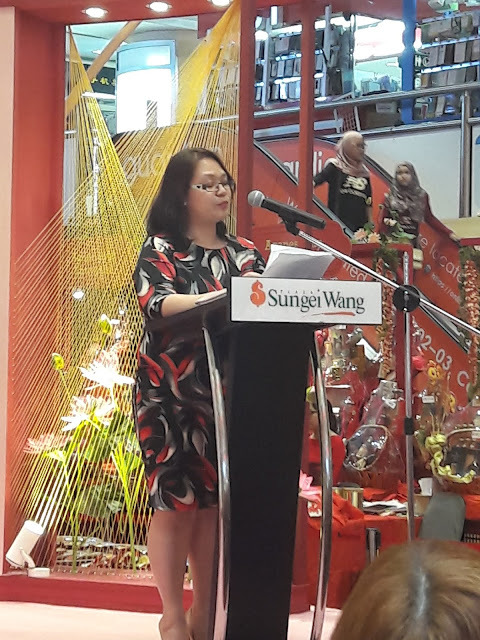 The launch is officiated by Ms Yuen May Chee, Complex Manager of Sungei Wang Plaza, Mr Joseph Teo, Head of Marketing Communications and accompanied by special appearance of Major (H) David Teo, Director Silver 小华导演， Jeff 陈浩然， Beauty 张文盈， Bernard 邱文博，Emily 陈子颖，January 苏湘庭，Fancy 吴胤婷，Bosvin 曾重凯 and Juztin 刘界 辉. A video on CSR initiative to Rumah Victory Elderly Home was shown. It was followed by a Koi Fish FengShui Painting presentation by Master Pang to the home and a souvenir presentation from Rumah Victory Elderly Home to Sungei Wang Plaza and Master Pang. The launch continued with the first ‘Love From Kampung’ movie promo for a meet and greet session where celebrities interacted with their fans. In the movie, some of the scenes were filmed at Sungei Wang Plaza to promote the well-established mall in Kuala Lumpur. 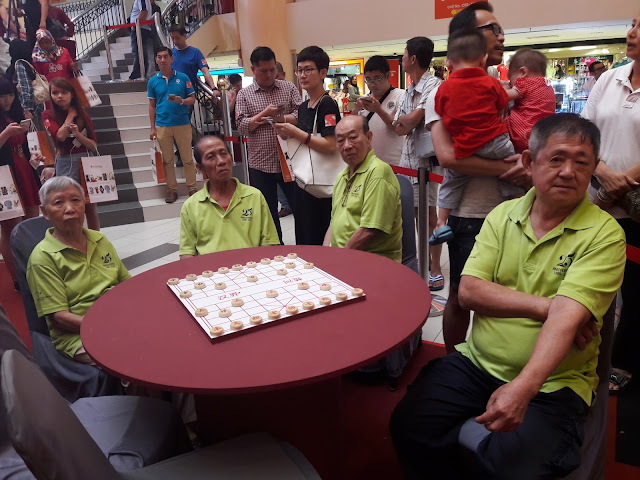 The launch is attended by old folks from Rumah Victory Elderly Home, representative from Star Cruises, MIG, SCCA, Shaolin GC Showtime Academy, Yites, Viralcham, Symbol Jewels and Youth Dreamss. My first lou sang this year and it tasted really delicious, sweet and sour. 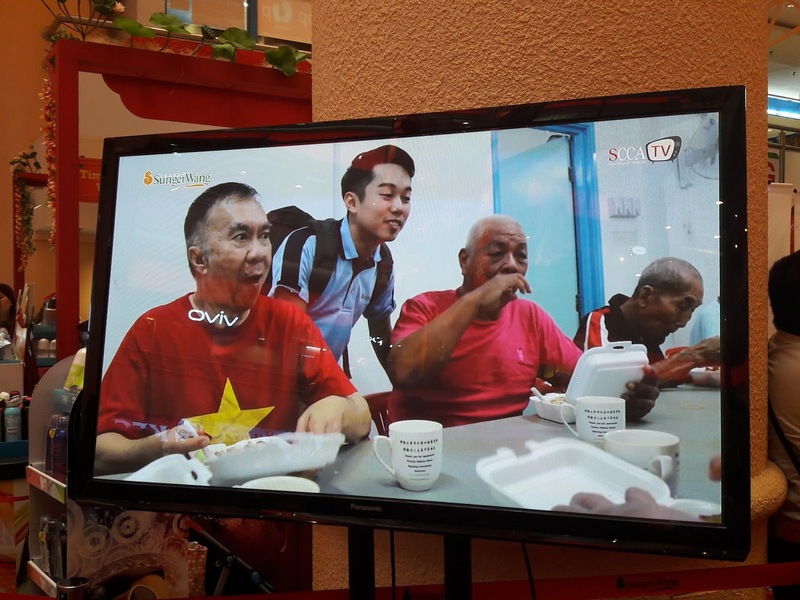 On 27 December 2016, Sungei Wang Plaza management team, SCCA and MIG celebrities visited Rumah Victory Elderly Home. The 59 old folks were entertained by lion dance performance and god of prosperity meet and greet session. The management cleaned and decorated the home with Chinese New Year decorations, while haircutting servicesfor old folks was done by SCCA team. Lastly, ‘yee sang’ and ‘tong yuen’ that were made by the management team together old folks and MIG celebrities were served together with everyone. A Donation Box, Abundance of Love for Rumah Victory is set at Concourse Level to raise funds for Rumah Victory Elderly Home. Come and donate generously and all donations will be used to upgrade the drainage system at the home and help with their daily expenses. 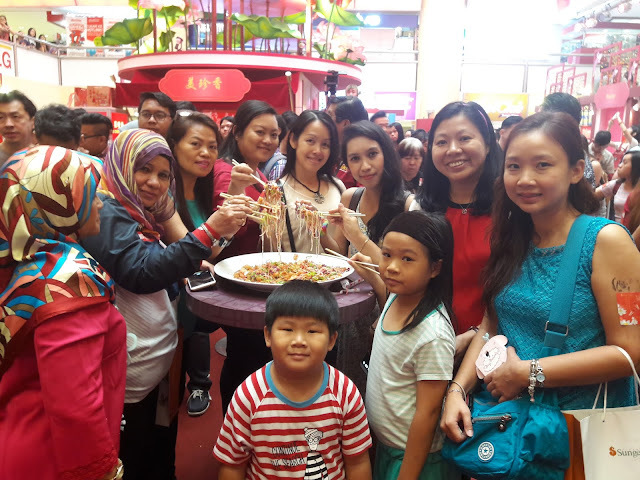 On 2 February 2017, the annual Magnum Chinese New Year Charity Programme supported by Sungei Wang Plaza that benefits thirty charity organizations within Klang Valley will be held at the centre stage with a series of programmes. Come and witness Magnum’s CSR initiative! It is the season of decorating and gifting! Visit our Chinese New Year Market Hall filled with wide array of festive goodies ranging from cookies, hampers, decorations, Chinese calligraphy, and accessories to even auspicious plants to bring prosperity and abundance to shoppers. Spot the God of Prosperity during weekends to receive the lucky treats from him that will bring you with good fortune for the year. Also, get a glimpse of the traditional Chinese costume, QiPao that will be featured in fashion showcase on 5 February 2017. 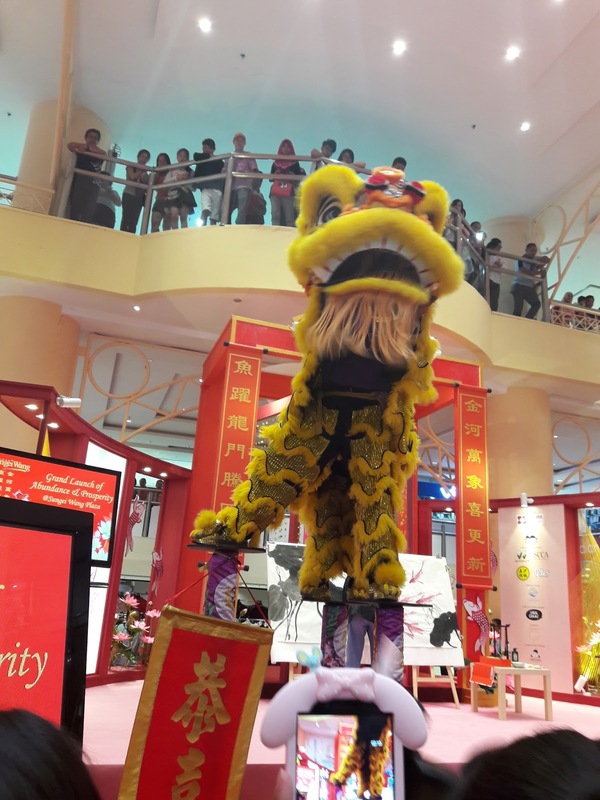 Be awed with the fascinating Chinese cultural performances such as Chinese traditional dance, Five Emperor Drum and Acrobatic Lion Dance over the weekends to enhance the festive mood during your shopping spree here at Sungei Wang Plaza. Free workshops for your kids! Bring your kids to experience learning with fun at our tailor-made workshops with a selection of Art & Craft or Pineapple Tart & Cookie Making workshops on weekends. Register now at Customer Service Counter, LG Floor to join the workshops. Would you like to show off your food decoration skills? Come join us for the one and only first ever Creative YuSheng Decoration Competition. Find out more at our Customer Service Counter, LG Floor. You got talent? Show off your talent at Chinese New Year Youth Singing Competition and Chinese Cultural Talent Competition. Register now at Customer Service Counter, LG Floor. Spring cleaning made easy with StorHub Self Storage! Simply store your items with StorHub at Sungei Wang Plaza, 6th Floor to make room for more. Chinese Cultural Exhibition Wanting to know more about Chinese culture? 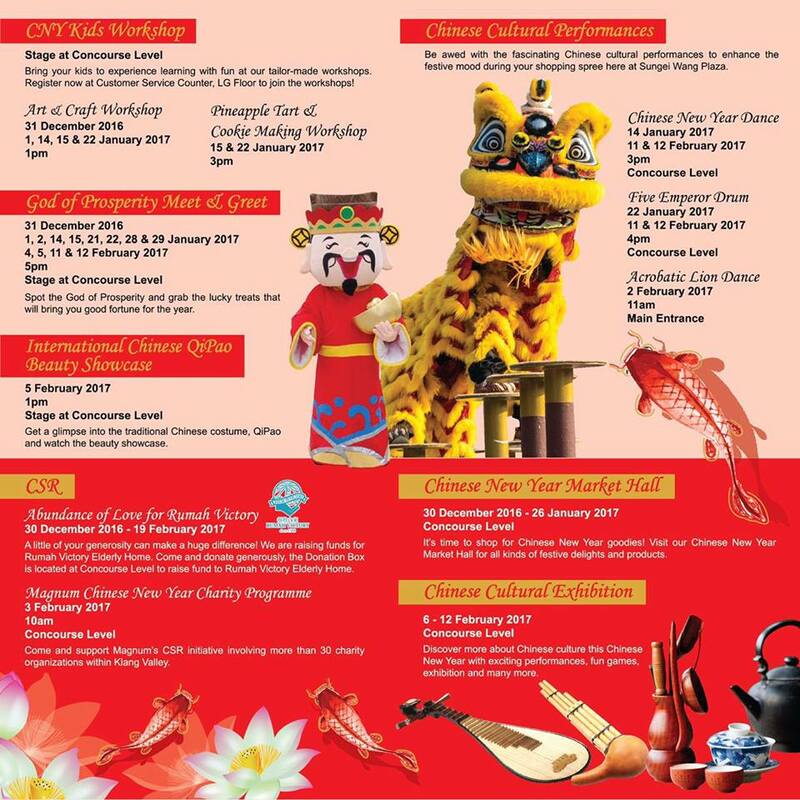 Visit us during Chinese New Year season at our Chinese Cultural Exhibition on Concourse Level and discover more about Chinese culture this Chinese New Year with exciting performances, fun games, exhibition and many more from 6 to 12 February 2017. 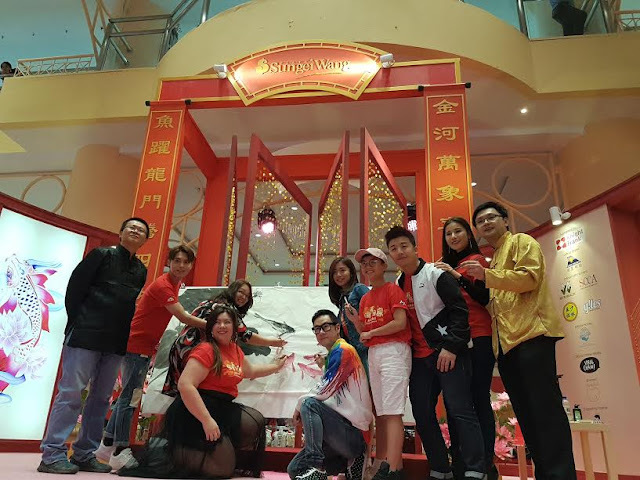 There are many activities happening at Sungei Wang Plaza. Collectable Ang Pao is back with four fascinating designs! Simply spend a minimum of RM188 in a maximum of two (2) accumulated receipts to receive a Sungei Wang Plaza Collectable Ang Pao packet. Collect all four designs from different weeks! Spend & Win an unforgettable cruise experience! Spend a minimum of RM588 in a maximum of 2 accumulated receipts and stand a chance to win yourself a 3-night cruise experience at Star Cruises worth up to RM8,560. Spot, Snap and Post a creative photo on your Facebook or Instagram and hashtag #AbundanceLoveAtSWP and you could win away yourself a pair of Gold Jade Pendants! Hurry and capture your best Chinese New Year moments at Sungei Wang Plaza! This 2017 Abundance and Prosperous celebration, Sungei Wang Plaza proud to have Star Cruises as Official Cruise, MIG, SCCA, Shaolin GC Showtime Academy, and Yites as Official CSR Partners, Viralcham as Official Online Media, Symbol Jewel as Sponsor and Youth Dreamss as Supporting Partner. For latest information about the events and promotions at Sungei Wang Plaza, kindly visit: http://www.sungeiwang.com or Sungei Wang Plaza Facebook at www.facebook.com/sungeiwangplaza.